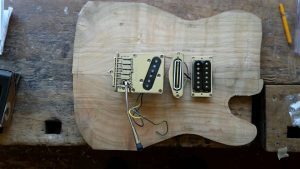 This year, Torsten Preuß will build a a special custom made Telecaster thinline with a arched top for me. A piece of maple for the back and cherry wood for the top, neck will be made from a wonderful piece of birdseye maple. Torsten has cut a thin slice off the back to make the covers for the milling grooves for tremolo and electronic routing. The only missing original part of „The Luminous“ is the cap that has previously decorated the icecone heel. 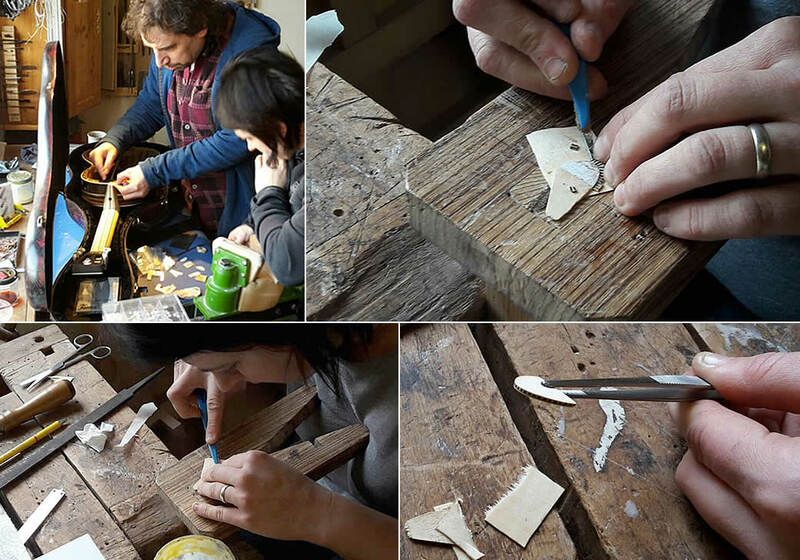 A great pleasure that Torsten and Friederike Preuß in Markneukirchen – who are specialized in fine work with mother-of-pearl – are about to create a beautiful heel cap suitable for this extremely fine guitar. For this a matching piece of mother-of-pearl had to be found, we threw more than an hour in boxes and boxes to find a worthy piece. 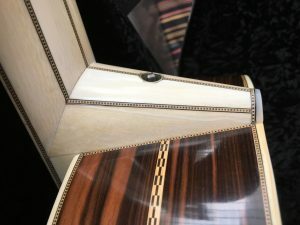 The more difficult part is, however, that the „all-rounder chessboard pattern“ („straight bead“), which is used everywhere on the sides and the neck, should appear again. I had not even dared to ask for it, since this endeavor appeared to me impossible, but Friederike and Torsten immediately decided that this should be so and that they find a way to use the same ornamental edge also there as a conclusion! A beautiful and multifariously reflective piece of mother-of-pearl will then be a highlight in the endpiece, also in the highly ornate rear view. Now the work has done – here are some photographs of the final result. I think it looks as if it has always been so. Many thanks again to Friederike Preuss! Many thanks to Mathias Adler from „Die Zupfgeige“ in Karlsruhe for the possibility to make an impression of the bridge, which is necessary for the preparation of a detailed copy. 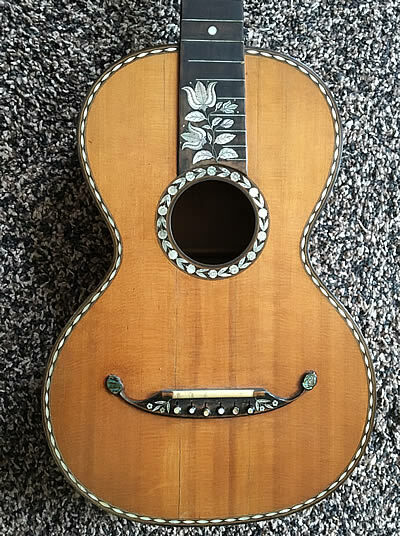 I am especially looking forward to my Christian Friedrich Bauer guitar, built in Klingenthal around 1860, which is still in restoration in Italy. Amongst others new in the gallery is the spectacular instrument of the company M. Schuster jun. Neukirchen (today Markneukirchen), that I got back at the end of 2016 after a complex and very tricky restoration. 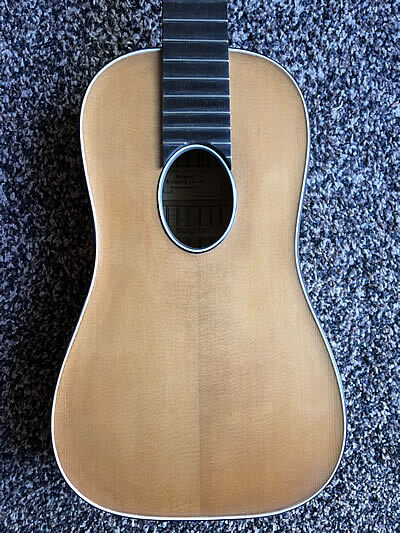 As usual in the Vogtland, this guitar was made anonymously, in this case probably for a princely customer. The order was presumably published by the dealer M. Schuster jun. 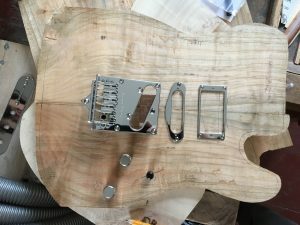 to one of the outstanding local guitar builders. 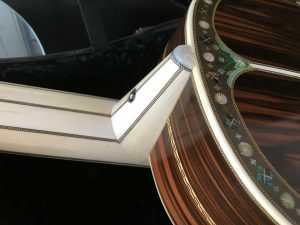 In this case, the client did not take it with his high clientele to advertise his company with an engraved name tag of mother-of-pearl on the fingerboard. In this case, however, at least the origin of the instrument is documented. 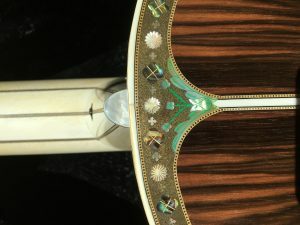 The instrument with its bright design with the different colored mother-of-pearl inlays (and frets!) was obviously created to shine up especially in candle lit rooms and to unfold its effect fully. As she sparkles and glitterings in the candlelight as if it is illuminated from the inside, it has got me the nickname „Die Leuchtende“ (The Luminous). Also pay attention to the ivory veneered neck! I would like to thank the Berlin violin maker, Florence Ford, who once again demonstrated an incomprehensible mastership in this restoration and has worked so wonderfully that it now shines again in full splendor. Furthermore, it is again fully playable and sounds amazingly good! I would also like to thank the guitar maker Dennis Tolz, who gave us advice and helped with some specific guitar technical problems. 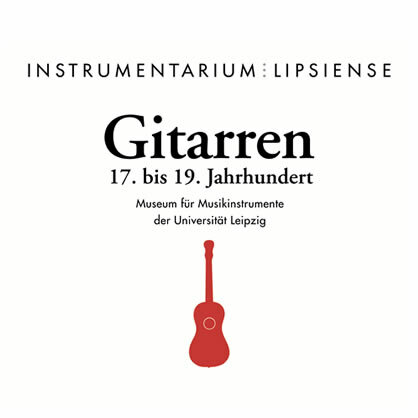 Musikinstrumenten-Museum of the University of Leipzig. Catalog, Leipzig 2016 by Andreas Michel & Philipp Neumann. This book is highly recommended. Prof. Andreas Michel has been involved in researching this topic for a long time and is a valuable and indispensable partner in the exchange of information with his comprehensive knowledge of the sources. The good cooperation with Mr. Michel is also due to the fact that I had the honor to proof read the catalog shortly before printing. With this volume, the museum continues the catalog series on the plucked instruments. 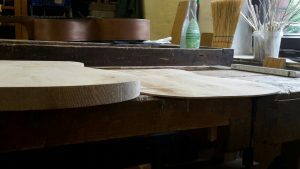 After the inventory of the Zithers, cisterns and the guitars of the Weissgerber collection, the guitars from the 17th to the 19th century are treated.  The authors have devoted themselves to the difficult task of scientifically investigating and evaluating the valuable but also very heterogeneous fundus of over 120 guitar instruments. In this catalog, 72 guitars from the period before 1900 are detailed and described. The catalog contains numerous new insights.